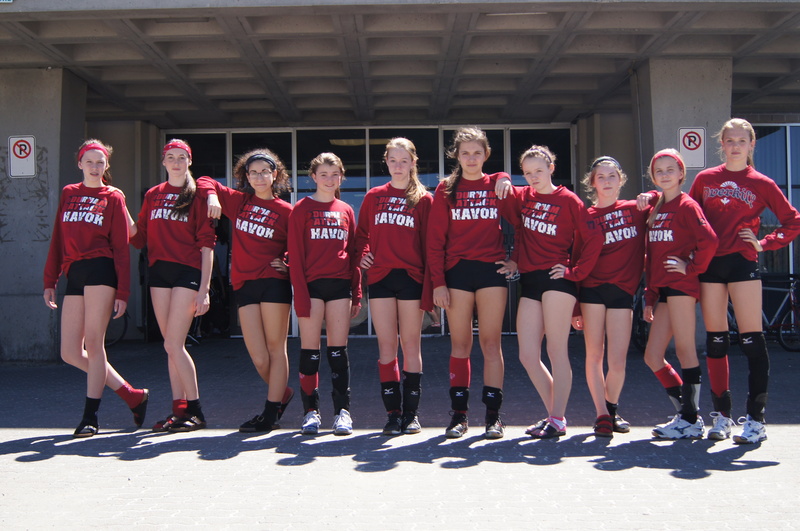 Havok players felt a bit more pressure this past weekend at the 14U Hawkins Cup in King City. 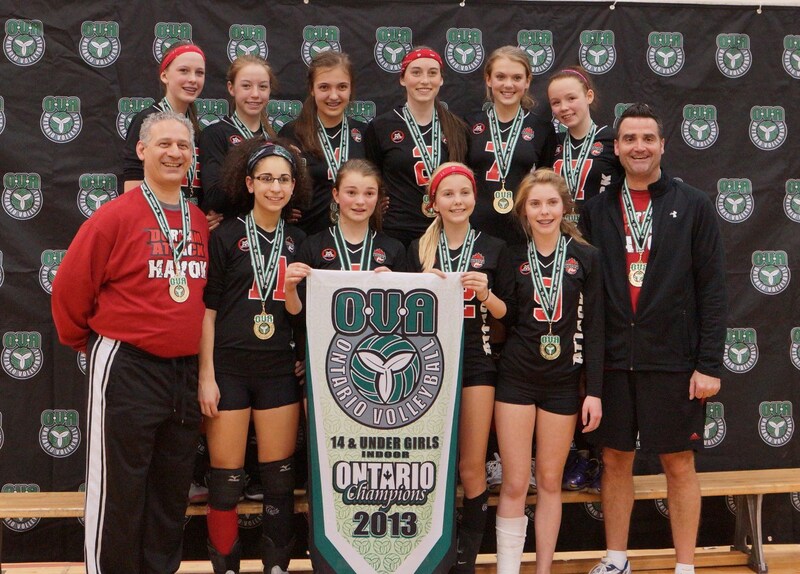 If they wanted to secure a coveted ranking in next month’s OVA Provincial Championships in Waterloo, they would need to finish on top at this final 14U tournament of the regular season. Ranked second in the Championship East Division, they knew it would not be an easy day ahead in this top tier. 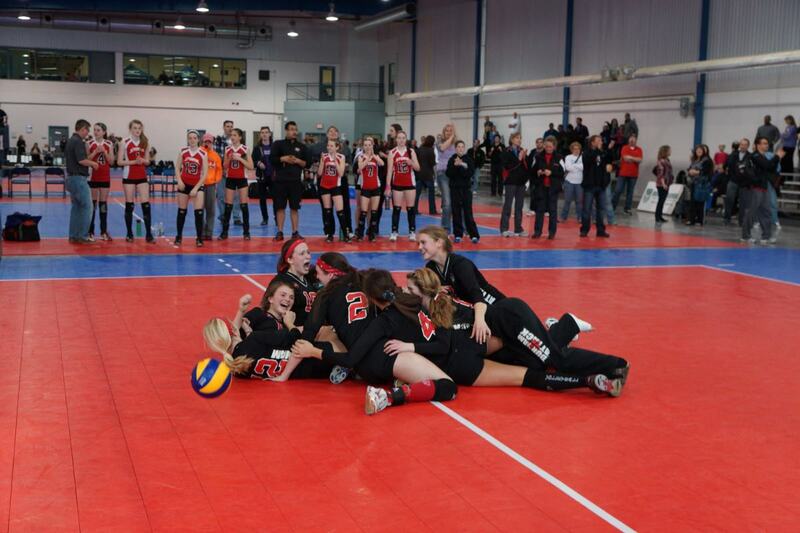 In pool play Havok defeated Markham Stingers 13U and Scarborough Titans Invasion in two straight sets. 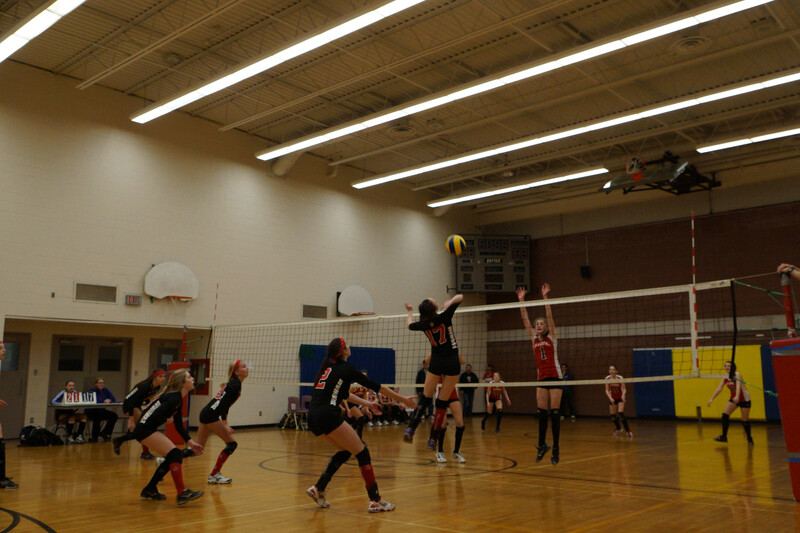 Playoffs brought a bit more of a challenge but the girls still managed to defeat Aurora Storm Typhoon and DRVC, once again in straight sets. The real story on this day began in the gold medal match. Havok would face this tournament’s top ranked Aurora Storm Vortex. This opponent has earned a great deal of respect from Havok players who knew that a 99% effort would never suffice in this match. These two teams have met twice before with each taking the gold medal once. 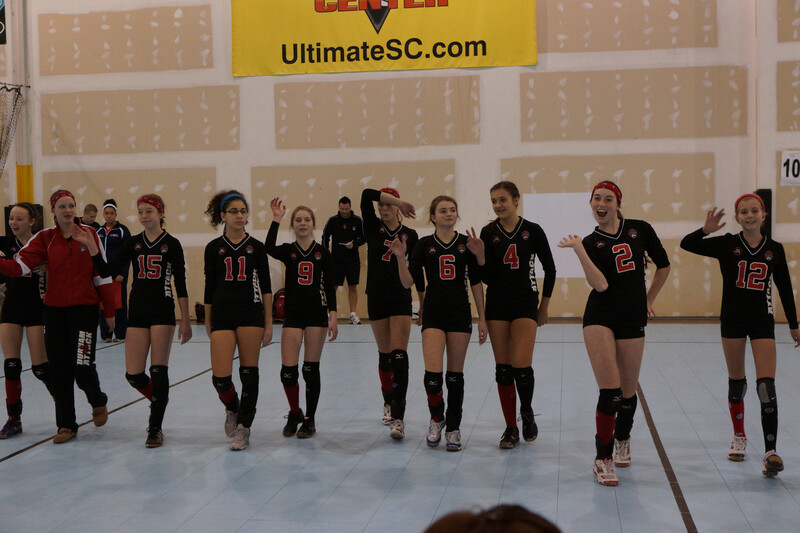 In their first encounter Havok took the gold in an exciting three game match that ended in a 15-13 victory for Havok. The second time around Havok was forced to settle for the silver but left more determined than ever to regain their Beast of the East title. In this third encounter Havok came out strong in game one with some solid digs and consistent attacks to take it 25-20. The second game was not like the first with Havok dropping some of its momentum allowing Vortex to virtually walk away with game two, 11-25. If any spectators decided that game three was not worth sticking around for then it’s a real shame because this is where the true excitement began. The bleachers swelled with curious onlookers and anxious parents who were doing all they could to settle their nerves. It was literally point for point that this game played out… 10-10, 11-10, 11-11, 11-12, and so on. At 14-13 Havok had the chance to take it but Vortex would not submit. Then Vortex had the chance to take it at 14-15 but Havok wouldn’t have it that way either. And so it went until finally at 18-17 Havok took advantage of its opponent’s unforced error and dumped the ball on the Vortex side of the net to end the game at a sensational 19-17 final. What an exhilarating end to an amazing day! Congratulations players and coaches. Thanks for providing your fans with a great display of talent and teamwork! Havok players are now preparing for both the 14U and 15U Provincials in Waterloo, as well as the 14U Nationals in Sherbrooke, Québec. Thanks to our Delicious New Sponsor! 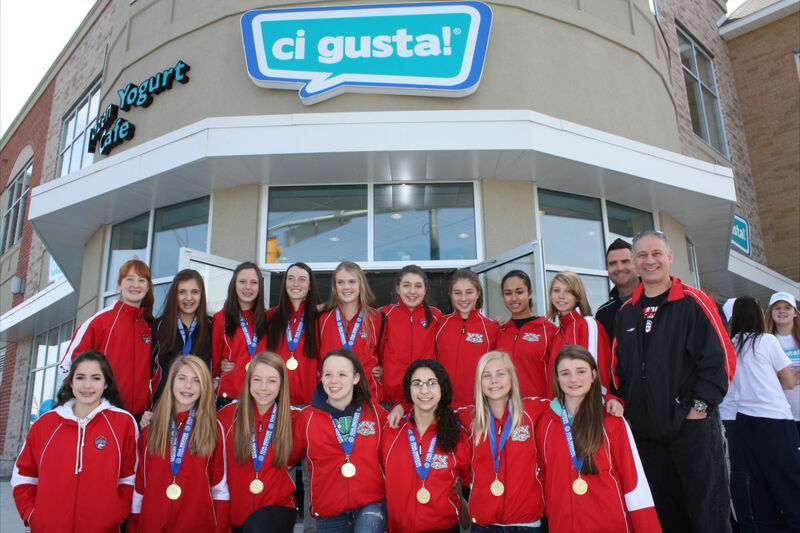 Members of Durham Attack Havok and Durham Attack Firestorm attended the grand opening of their newest sponsor, Cu Gusta!, on Sunday, March 24. 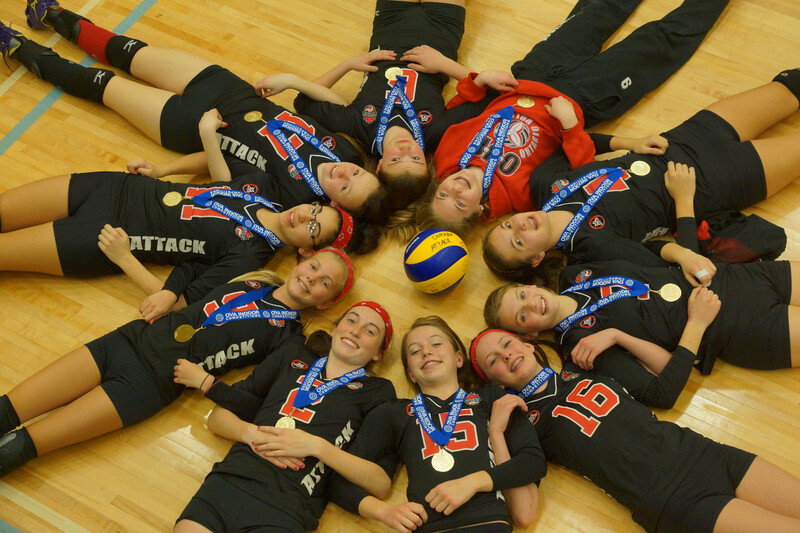 Havok players proudly display their gold medals earned the day before at the Hawkins Cup tournament in King City. Thanks for you support, Ci gusta! Everyone is looking forward to enjoying some delicious treats at your frozen yogurt café. At the final practice before leaving for their big adventure to Columbus, Coach Chris took a moment to remind his players that this trip to Ohio was not just about volleyball — it was also about coming together as a team and creating some great memories. When the girls from 14U Havok participated in the Ohio Valley Regional Challenge this past weekend, they took full advantage of the opportunities awaiting them. As the only Canadian team in this U.S. tournament, Havok generated a lot of attention. Players giggled after hearing comments from their American hosts like, “You have the cutest accents” (accents…we don’t have accents) to “Do you all speak French?”. Even Coach Chris generated some attention from a local coach fascinated with his coaching style. Wherever Coach Chris went, his new “groupie” seemed to be close by with his video camera studying his warm-up drills and courtside strategies. Another great experience for the girls was being responsible for providing all scorekeeping, line judge and second referee duties. Mom and dad couldn’t help them out of this one – it was players only. Each player would quickly need to learn how to track substitutions and liberos, make a split second decision on whether the ball was in or out, and use the proper hand signal for a lift, double, foot foul, etc. Afterwards, many players commented that they wouldn’t mind getting the chance to do this at home. 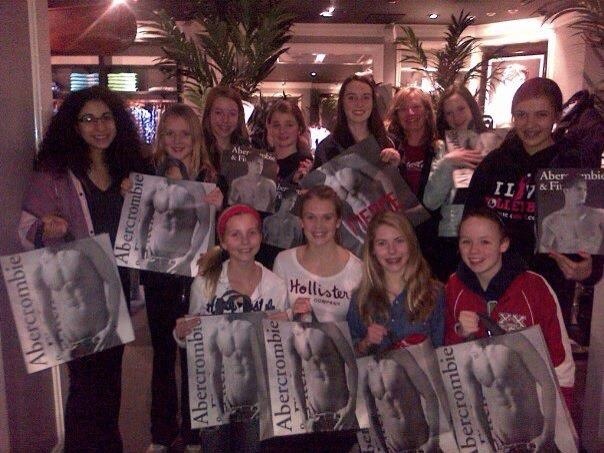 After a long but successful day Havok families earned themselves a night out and went for dinner to Brio’s at the beautiful Easton Town Center and while the meal was delicious, dessert came in the form of a trip to Abercrombie & Fitch and a 70% off sale! No, this weekend was not just about volleyball, it was now about getting 70% off at A & F. It was like a mass exodus as these awe struck teens converged on the ladies’ section of this iconic store. Parents became personal assistants holding this, carrying that, and trying to keep track of how much this was going to cost them. Day one had definitely proven to be a rewarding day on and off the court. Day two would prove a little tougher (although cheaper for parents) as Havok was getting closer to playing in the top tier and would face some of the region’s top-ranked teams. The first game against Academy Volleyball Cleveland was hard-hitting but Havok managed to take it in two straight sets. Next up was Zenith Peak and while this one took three sets, Havok came out on top and would advance to the tier 1 semi-finals. This round found Havok facing a very tough Buckeye Red Elite (ranked 2nd regionally) and they were not able to bring the same momentum they had brought to the court in previous games. Even though they had dropped only one game all weekend, this loss would mean the end of the road for Havok but it wasn’t the end of the fun…after all it was Super Bowl Sunday! Back at the hotel families gathered for a final night of fun, relaxation, and football fan frenzy. No doubt each player on Havok would give you a different story about her favourite part of the weekend but all would agree that it was a lot of fun and an amazing experience for everyone involved. 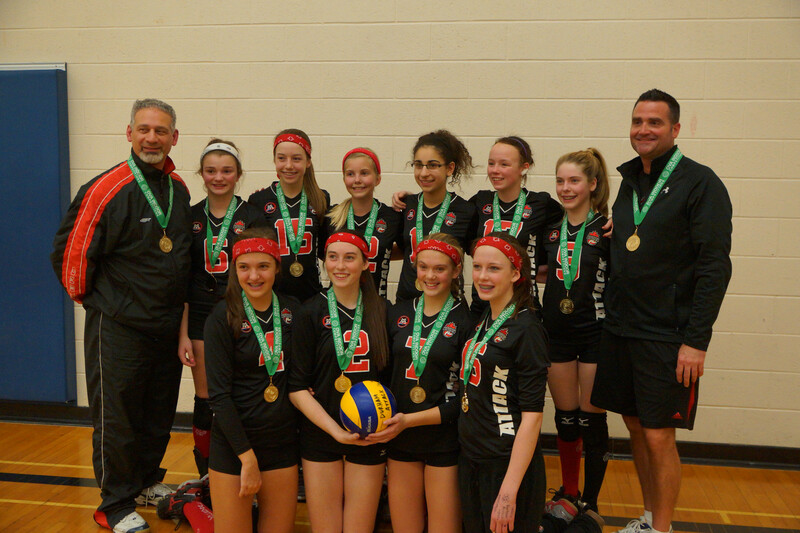 Durham Attack Havok ventured to Richmond Hill this past Saturday for their second OVA tournament of the 14U season. Havok was playing in the Championship East Division of the Challenge Cup and, while a little nervous about some of the competition, all were looking forward to playing some high calibre volleyball in this top tier. On this day, the girls were all trying to come up with ideas on how they could avoid the mistakes of the previous weekend’s 15U OVA tournament where, after dominating in pool play by winning all of their games in two straight sets, the girls lost their momentum and failed to advance into the medal rounds. Proper nutrition, remaining focused, staying hydrated, keeping your body moving between games, listening to music…everyone had ideas but only time would tell if any of them would work. So when this Saturday’s rush out of the starting gate seemed like more of a saunter, many started to worry. What would it take to see some fire in this group? During pool play the girls had difficulty getting into their groove and while they were fortunate to come out ahead (winning both games in two straight sets against STVC Invasion and Storm Typhoon) they were not playing to their potential and fans were left wondering if this would be another “one of those days”. After pool play the girls took a quick break and listened to some motivating words from Coach Chris before returning to the gym to face Ottawa Fusion Black. 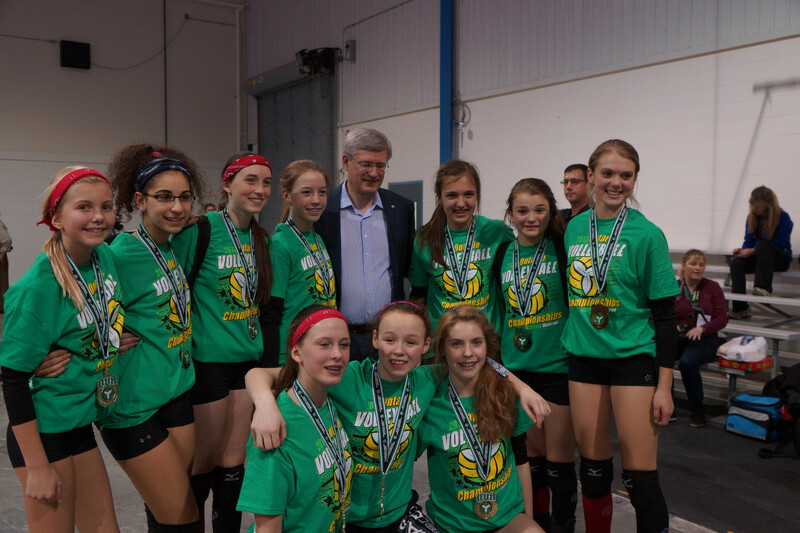 While a little disappointed that Prime Minister Harper wasn’t in town to watch his daughter’s game, the girls easily managed to take the Bytown team in two straight sets enabling them to advance into the medal rounds. Some say it was the Puusa Smoothies, others say it was the sheer determination not to lose to another local team; but this semi-final match against DRVC finally brought about the momentum Havok supporters had been waiting to see. Havok came on strong and took DRVC in the first set 25-10. The second set proved tougher but Havok still came out ahead winning 25-22 to advance to the gold medal game. This was it. Havok was finally facing the team others kept saying would be the one to beat this season. 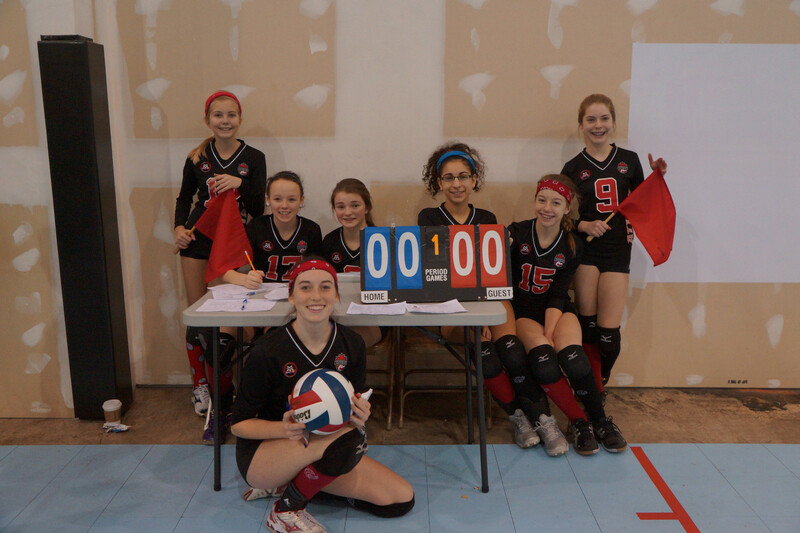 Aurora Storm Vortex came into this tournament seeded first but Havok planned to prove the rankings were flawed. While Havok was still making some uncharacteristic errors, they managed to come out ahead in the first set 25-21. The second set saw the tables turned with Havok falling to Vortex 14-25. Havok only had one final and deciding set to prove who was the Beast of the East. While Havok’s errors weren’t completely eliminated, they did not allow these errors (or questionable calls by a line judge apparently watching the wrong line) to get the best of them. Each player was determined to come together after every play and support her team mates. With Vortex leading on the scoreboard 6-10, many were starting to pack up their belongings for the day – but not Havok. After returning to the floor after a time out, this comeback story began to unfold. Led by some amazing defensive plays, the offensive plays began to kick in and Havok closed the gap to pull ahead 14-12. Vortex then called a timeout and narrowed the gap to 14-13. A strong serve by Vortex had Havok’s back row scrambling but they managed to send a free ball back to Vortex that landed narrowly within their boundaries to seal the deal and earn Havok a 15-13 win over Vortex. Congratulations Havok! Your display of determination and perseverance inspired many on this day and we look forward to watching the rest of your story unfold this season. Havok will be travelling to Columbus, Ohio the first weekend in February to participate in the Ohio Valley Regional Challenge. Good luck girls! Don’t forget to LIKE Havok on Facebook at www.facebook.com/Havok14u to stay up to date on our news and events! Thank you to all of the local businesses who have sponsored Havok for the 2012/2013 season. What an incredible year of sponsorships! If you haven’t already checked out Havok’s Facebook page, have a look. We have links to our sponsors’ pages as well as team updates and news. Share https://www.facebook.com/Havok14u with family members and friends who want to follow Havok on our journey this season. Don’t forget to like our Facebook page if you’d like to get the lastest team news and updates!